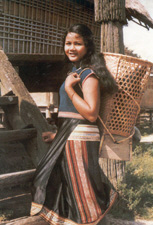 The Bahnar, also spelled Ba Na, people from Vietnam, traditionally residing primarily in several Central Highland provinces, arrived as refugees in North America shortly after the Vietnam War. They trace their ancestry back many centuries to communities co-existing on the coastal plains with the Cham and Jarai. Their cultural tradition is filled with a great number of musical instruments, including ensembles of pitched gongs and string instruments made from bamboo. These instruments were sometimes played in concert for special occasions, which may also involve ceremonial rice wine drinking and group dancing. Traditionally the Bahnar practiced ethnic religions. Many American Bahnar claim Christianity as their religion. Pray God will work through and in the lives of the Bahnar people to grow in their understanding of Jesus Christ. Pray for evangelical Bahnar to be light to the least reached peoples in North America.